Can’t deny it, this was a tough category for me this year, I’m still mourning the loss of Kate Somerville products, which have been withdrawn from the UK completely, denying me my regular dose of Goat Cream, and, I’ll be honest, I still haven’t found a moisturiser that I love as much as that much-missed product yet. However, Zelens is proving a real contender, I have to say. I’ve spent the last quarter of the year fairly ill with kidney problems (both serious and not), and as a result, my skin has suffered. It’s been dehydrated, reddened, flaky and prone to spots recently, which has been infuriating. 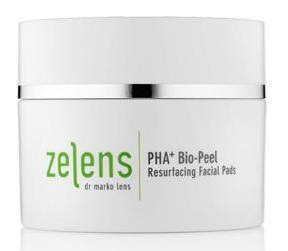 However, Dr Marko Lens is a skincare genius, and, in particular his PHA+ Bio-Peel Resurfacing Facial Pads have been a lifesaver. Gentle enough to use twice a day, with it’s blend of Poly- Beta- and Alpha- hydroxy acids, these have helped refine my skin, and soothe the redness. They tingle a little on application, but I can tell the difference every single time I use these, I can’t imagine being without them again, even if I have had to cut the pads in half recently so I could eke them out, and make them last! I love that the entire range is mineral oil and paraben-free too. I’ve been following my use of the pads with the Zelens Z Recovery Intensive Moisture balm, which I adore – the gel-texture just suits my skin down to the ground, and I find it makes a magnificent night-cream on dehydrated days. I think I need to try the Moisture Infusion, I have a feeling it might make a better day cream for me – could it be the one to replace Kate Somerville? Who knows … It’s pricey, but for me, it works, and therefore it’s worth every penny. The Fine Print: PR Samples. Kidney problems all my own. They are expensive, Lucy, but dangnabbit, they're GOOOOOOOOD! You know that Polish Brand Ziajia i think its something like that, I saw they have a goats milk moisturiser, I haven't tried it or anything but i wonder if its anything like the kate somerville goats cream. Thanks for the tip, Pink (can I call you pink?) I think I have some investigating to do! I have the same exact skin issues- dry, dehydrated but also prone to spots! I have been using the Zelens pads and Recovery balm as well. Both are amazing! I just purchased the eye cream as well. It is a lifesaver for dry undereye skin! Nice review, that sounds like a great product. Sorry to hear about the kidney issues but it sounds like you are doing great. Price is always worth it if the products work. I think a beautiful facial at night is great as part of a total pampering routine, even in the bubble bath. Keep up the good work!